We’ve been working part-time on our own take on the IO game for close to a year. Exocraft is an action/strategy persistent MMO that is focused around more depth and progression than most IO games. 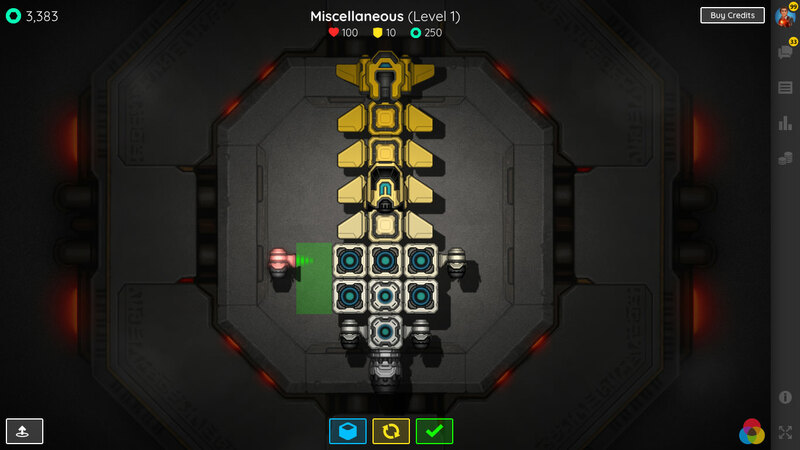 You start as a small mining vessel and build up your unique ship using dozens of available parts. 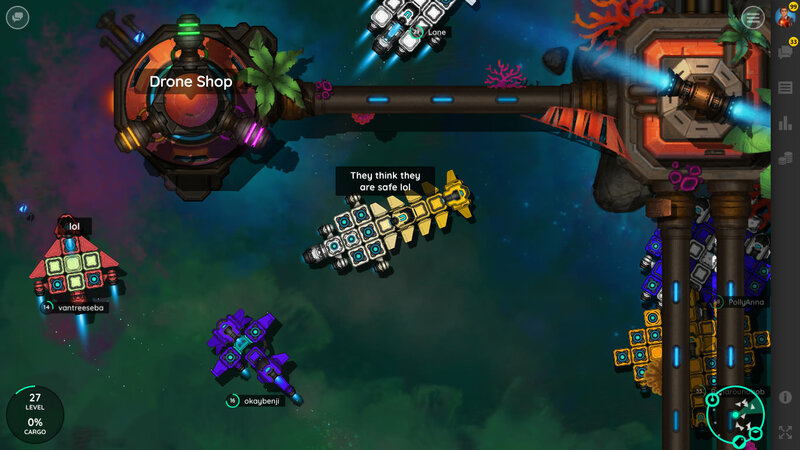 Team up with others to mine and battle planetary defenses on a dying alien world for resources, or compete in skirmish-style tournaments to reach the top. The game is built with Phaser-CE on the client and uses a custom server built with Node.js, MongoDB and Redis -- backed by our own GoldFire platform for signup/login, communication, achievements, etc. All players are in the same world, so there are no servers to choose from. As more players come online, the world will dynamically size up and down to fit the number of players and maintain resource balance. You can play now at https://exocraft.io, and any feedback is greatly appreciated! The art is absolutely stunning and the game very polished. A huge congratz on this very ambitious game! @WiLD11@Skeptron Thank you, very much appreciated! I especially liked the atmosphere created by the music, and how it merges with the notes that the collection of crystals generates. Another interesting detail is that you can see how crystals are generated by the fall of meteorites. I found some difficulty in planning my strategy due to the lack of information in the hangar shop about the usefulness of each item (maybe some tooltip on items). Other example: I did not find how many points of life are left for my ship (an important fact to decide to attack or withdraw). @onlycape Thanks, I'm glad you like it and that you noticed some of the small details that we had fun implementing! Also, thanks for the additional feedback. I did not find how many points of life are left for my ship (an important fact to decide to attack or withdraw). Hello? I really need help because Im low on crystals and the emergency keeps bringing me back to the base. Im having trouble in this game. Thanks! Brilliant game, absolutely love the graphics and movement. The tutorial is great but still a little cloudy on the damage and fixing the ship. Takes a bit of playing to get used to but all in all a definite success. Hoping to see this get popular and grow! Great work. Thanks! Yeah, we are going to continue working on those things, but the last few days we've just been in overdrive re-writing big chunks of the server to try and handle all of the new players. Awesome game, and beautiful graphics like stated above. I've noticed some weird lag issues but I could only imagine with the amount of players playing. Great job and keep up the good work! I found a little bug in the game after a server lag. Now my minimum cargo level is -9% and the maximum 91%. It seems that you did not expect the game to have so many players. It gives the impression that the server is going to explode at any time. Good luck with the updates!! @onlycape We were hoping to get a lot of players, but we thought it would be more of a slow ramp up not everyone all at once lol. If you wouldn't mind letting me know you username, I can take a look and try to figure out why that is happening. 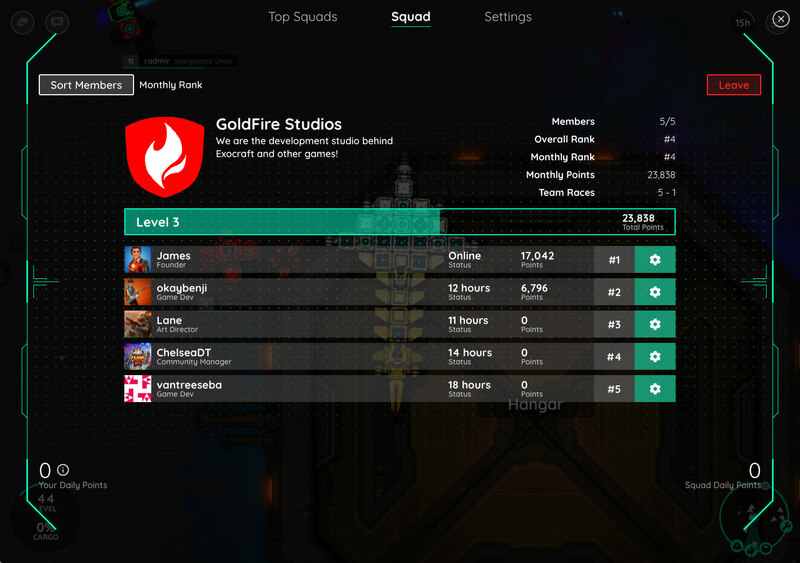 @GoldFire After close game and reopen it, the bug has disappeared. Now 0 crystals = cargo 0%. In case you need it, my username is "onlycape" (i'm not registered, but is the profile name). We've now moved all of our hosting from AWS to DigitalOcean and have gotten noticeably better performance for a significantly lower cost (we'll be doing a tech writeup as soon as we get some spare time). 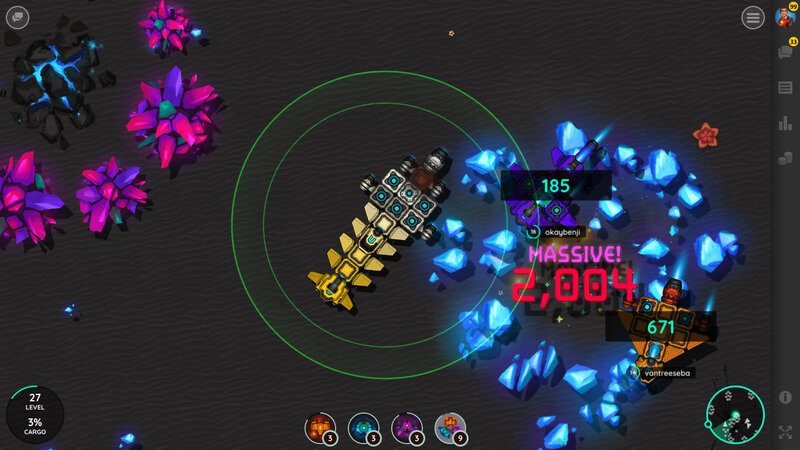 We've also got several big updates to the gameplay coming soon (focus has been on bugs and performance so far). This is amazingly good. My favourite bit is the little dust clouds that hover under the ship when it stops. 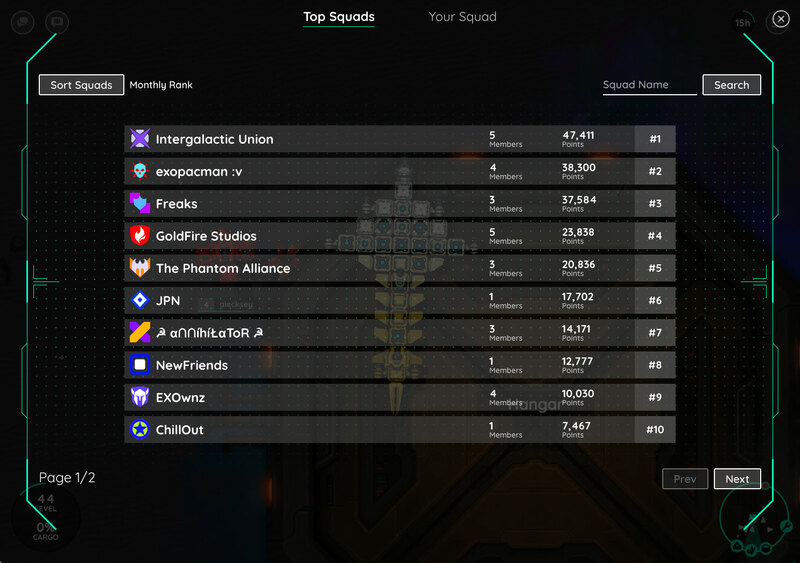 We just released another big update that includes Squads (similar to clans/guilds in other games). The feature is fairly simple right now, though we plan on expanding it over time. The focus is on forming a small group of friends and designing a unique identity with the logo designer that provides thousands of unique combinations. There is also a monthly leaderboard based on our Team Race feature. 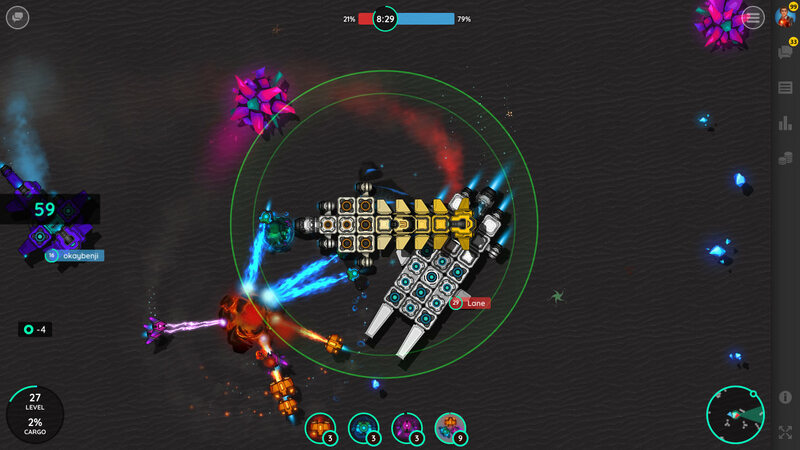 We've spent the last month porting the game from Phaser-CE to Phaser 3 and it seems to have paid off! We are seeing performance gains around 300-400% across the board (not out of the box, we've done quite a bit of optimizing and are using our own custom pipeline, but we were doing that with Phaser-CE as well). With these new performance gains we are going to be able to do some new things that we just couldn't before, which we are pretty excited about. It is very pretty, very polished. I tried it on my mobile (s4 samsung galaxy) but it runs about 10 frames per second. Will try on desktop later. It might be tough to get it running well on an S4, but we are getting smooth 60fps on iPhone 6S and a Samsung from 2 years ago (can't remember which model). However, we've yet to do any optimizations for performance and for the UI on mobile yet. That is one of the next things on our list as we'll be releasing native apps with Cordova later in the fall. We've just released our biggest update yet! This one comes with two major new features that add a lot more depth and strategy to the gameplay (and open things up for us to expand on that further with upcoming updates). 1. 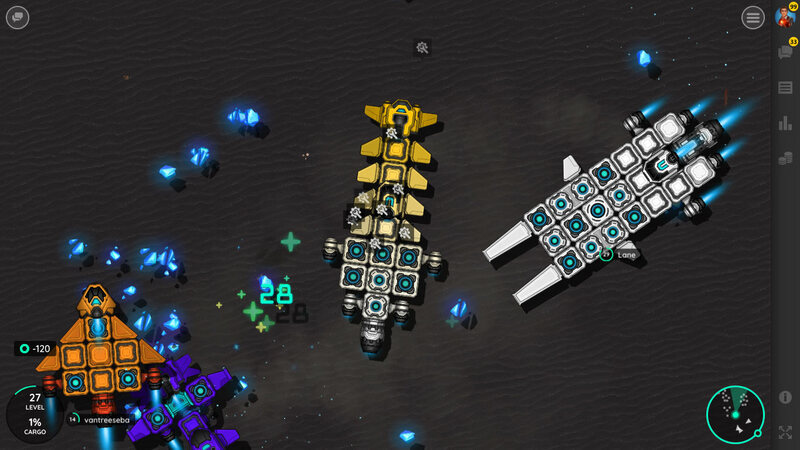 Fleets - Instead of just being a one-off ship, you can now build as many ships as you want and store them in your hangar. You are now positioned as the owner of an entire space mining company and can rise up the ranks as the most profitable in all the galaxy. 2. Crews - You can't run all of these ships on your own, so we introduced the crews feature that lets you hire droids, people and aliens to man your ships (and some spiffy new art to go along with it). Did you manage to monetize the game, or it is just a great hobby? GoldFire Studios started as a hobby way back in the day, but we have been a full-time business for around 7 years now. 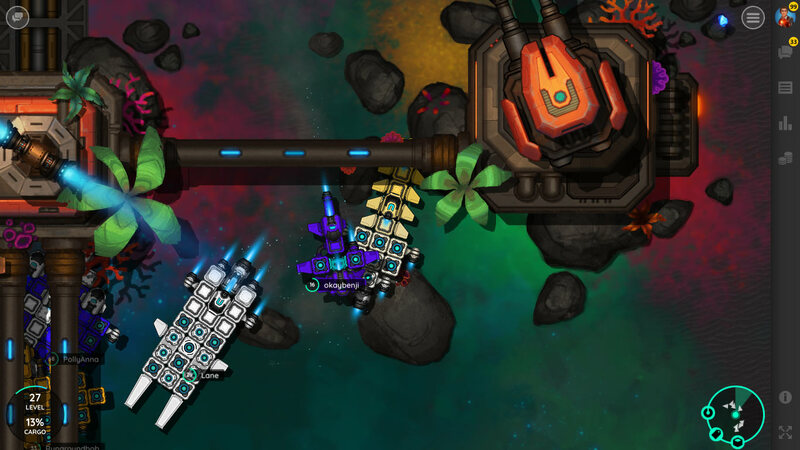 We are still very small (3 devs and 1 artist), but our games are able to support the studio.